This twisted half-up bun has become a go-to hair style for me! I usually finish it in under two minutes, including adding extensions, and it looks way more complicated than it actually is. I like it for day 2 or 3, unwashed hair. My hair is already curled and the hair usually has a little more grip vs freshly washed hair. Each year, Kristin Ess releases these gorgeous hair sets for the holidays. The sets usually include a styling product and a french hair pin. I wanted to do a tutorial to show how to use the pin. I swear it’s actually easy, you just need to see how to maneuver it into the bun. French pins hold your hair so much more securely than you’d think, based on how delicate they look. 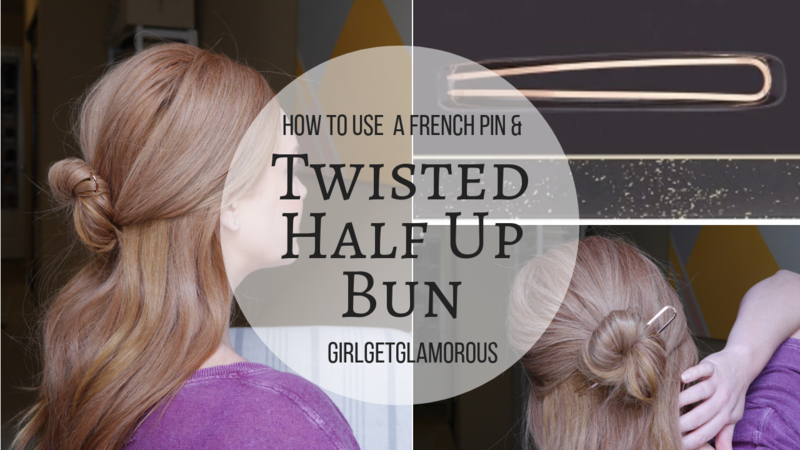 I love the look of this half up bun and the french pin adds such a sleek finish. The other bonus is that this style works on a variety of hair lengths. Step 1 | add a few extension wefts if you’ll be wearing extensions. Make sure they are clipped in horizontally, below where you will be parting hair for the bun. Step 2 | tease hair at crown. Step 4 | gather hair from the top of head to just above the ear into your hands at the back, middle of your head. Step 5 | start to twist the hair into a bun. For a more secure bun, twist the hair vertically first, before twisting into a bun. Step 6 | it’s french pin time! Holding the bun in one hand, and the rounded side of the pin in your other, start to slide the open side of the pin down vertically into the bun. Then maneuver the rounded side of the pin to horizontal, slide the pin through and then slightly back up and out the other side of the bun. Step 7 | holding the bun in one hand, gently pinch the hair above the bun and then tug it upwards. This creates extra volume. Repeat until you are happy with the volume level. Thank you so much for reading! Please let me know if you try this hairstyle or a french pin. I’d love to hear what you think! As always, thank you for reading and being a part of the blog!